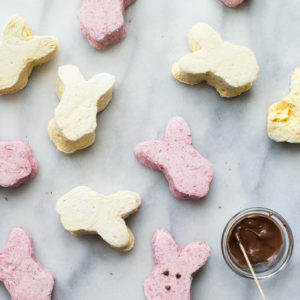 These paleo peeps are the perfect paleo Easter candy. 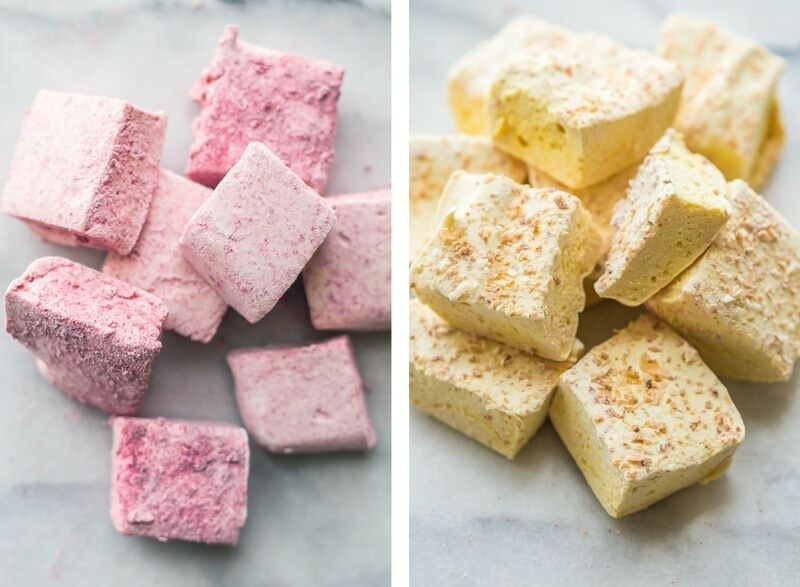 Made from homemade raspberry paleo marshmallows and toasted coconut lemon paleo marshmallows, you’ll be shocked at how similar they are to the traditional treat, but made only with healthy ingredients. 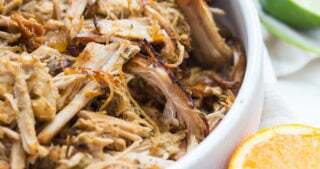 A paleo Easter staple! Or cut them into cubes for an anytime paleo dessert. There’s some sort of magic that happens when you make marshmallows from scratch. 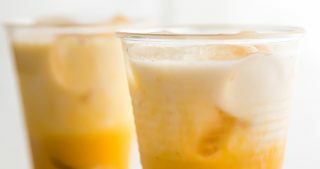 You watch the underwhelming syrup slowly billow up in the stand mixer, lightening and fluffing, becoming impossibly sticky and airy. The fact that it happens every single time still takes me by surprise. “It worked!” I think, though I can’t recall a time when my marshmallows went flat. Is that even a thing? So when my paleo peeps (paleo marshmallows made during springtime, duh), sweetened with only honey and no extra funky stuff, transformed from a watered-down honey syrup to a fluffy, white, marshmallow goo, I was absolutely in awe. And then I tasted them, my raspberry paleo marshmallows and my toasted coconut lemon (YES I KNOW) paleo marshmallows: they were delicious. They didn’t taste too much like honey. They had the same texture as a regular marshmallows. What? PALEO PEEPS Y’ALL. You can imagine my bliss, no matter how easily piqued my marshmallow-induced happiness is. When I had the idea to make paleo peeps (paleo marshmallows with bunny eyes, dammit), I felt kind of like a genius. Never mind that they’d been made before, no no no. I felt damn proud of myself for taking on the spring favorite and turning into a gut-healthy paleo Easter candy made with all real ingredients. 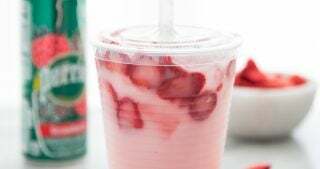 Speaking of ingredients, I think you’ll be surprised at how simple and straightforward they are: honey, water, gelatin, water, vanilla extract, freeze-dried raspberries or lemon + coconut, and arrowroot. 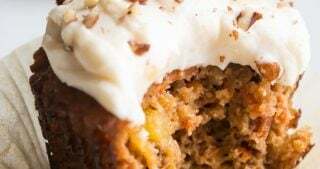 If you’ve been eating a paleo diet for any matter of time now, you know we live and die by the arrowroot, and it works so beautifully in this case, dusting the sticky edges and creating that light, powdery surface we’ve come to love about marshmallows, whether they’re paleo marshmallows or good, old-fashioned corn syrupy bites. And then the process: I opted out of making a video for this recipe because I was so seriously overwhelmed by the process. I figured it had to be difficult and quite involved, but I ended up spending most of my time dancing from the waist down to my St. Vincent Pandora station via Alexa, always yelling at the poor ol’ girl to change the song whenever something depressing came on. So here’s how it works: you boil some honey and water, then you pour some water over a couple packets of gelatin. 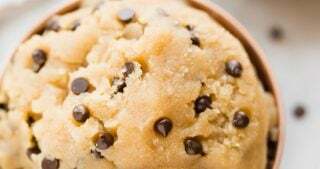 You mix it all together and throw it in the stand mixer. Beat on high for 5-7 minutes or so, then spread it all out in a parchment-lined 8×8″ baking pan. Let it air dry for a few hours and tada… paleo marshmallows. Or… paleo peeps?! Yep. You’re a badass. 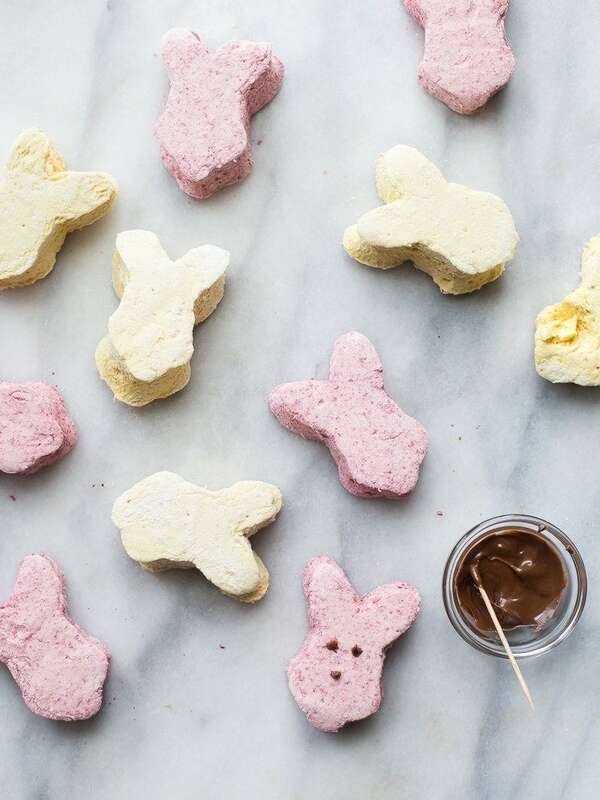 You can 1000% make this recipe just plain paleo marshmallows, either the raspberry paleo marshmallows or toasted coconut lemon paleo marshmallows, but cut them into bunny shapes? You just might die from the cuteness and cleverness of your little healthy self. And if you’re wondering if they taste terribly like honey, they really don’t! I was probably most surprised about this part, assuming that they’d taste heavily of the stuff. Weirdly, they don’t, but have this lovely fruity taste that’s a bit tangy and not overly sweet. Both are colored naturally, so you can feel good about giving them to your littles… and Leo ate almost half of an entire pan of these paleo peeps. HE’S 18 MONTHS OLD WHAT HAVE I DONE. 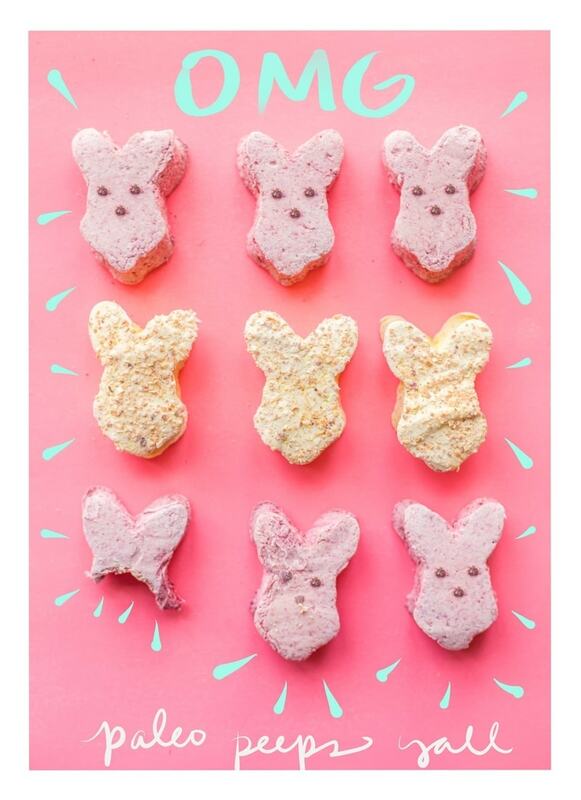 Make these paleo peeps for a paleo Easter or just for an everyday treat! 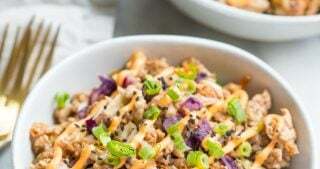 They’re indulgent without breaking your commitment to real, healthy foods, and I think you’ll be surprised at just how damn delicious they are. These paleo peeps are the perfect paleo Easter candy! 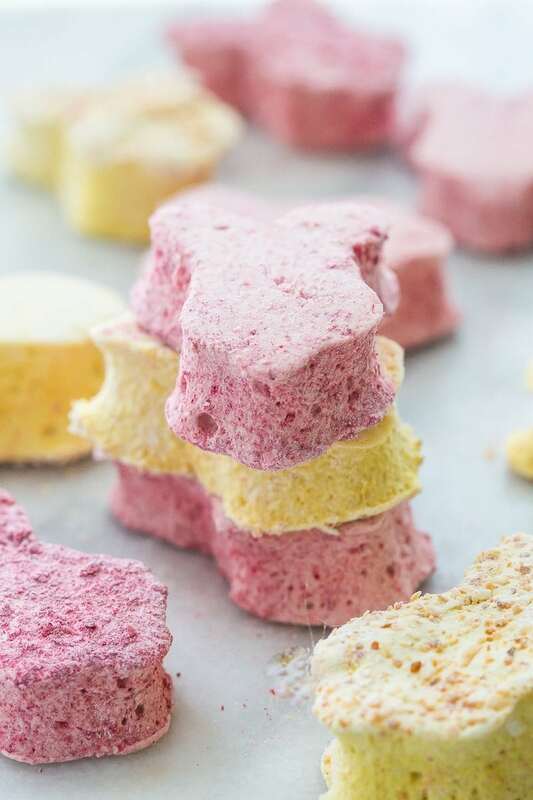 With recipes for both raspberry paleo marshmallows and toasted coconut lemon paleo marshmallows, you'll love the tangy sweetness that the light and fluffy bites offer. Cut them into bunny shapes and you've got yourself a healthy version of the Easter favorite. Place freeze-dried raspberries in a blender or food processor and blitz until powder. 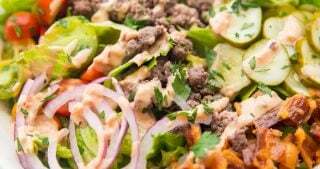 Separate out 2 1/2 tablespoons and set both aside. Prepare your pans: grease an 8x8" pan with a little coconut oil. Take a piece of parchment paper and rub the top of it with a bit of coconut oil. Press the parchment paper evenly down in the middle of the baking pan, then sprinkle a bit of arrowroot on top. Shake around to lightly coat. Place gelatin in a small bowl and sprinkle 1/4 cup water over. Stir to mix and set aside. Combine 1 cup honey, 1/2 cup water, and 1/4 teaspoon salt in a medium saucepan with high sides. Place over medium heat and bring to a gentle boil, whisking until very smooth and well combined. Continue boiling very gently for 10 minutes, or until a thermometer reaches 240ºF. Remove from heat. Stir in gelatin and water mixture and whisk until very smooth. Let cool for about 2-3 minutes then stir in vanilla extract. Add honey syrup to the large bowl of a stand mixer with whisk attachment. Beat on high speed for 5 minutes or until tripled in size, almost white. The texture should be like a soft lava that holds a soft peak for a few seconds. Add in raspberry powder (minus the 2 1/2 tablespoons you set aside) and beat for another 2 minutes, or until well combined and a lovely, even pink. With a rubber spatula, scrape out marshmallow mixture and spread into one prepared 8x8" pan. 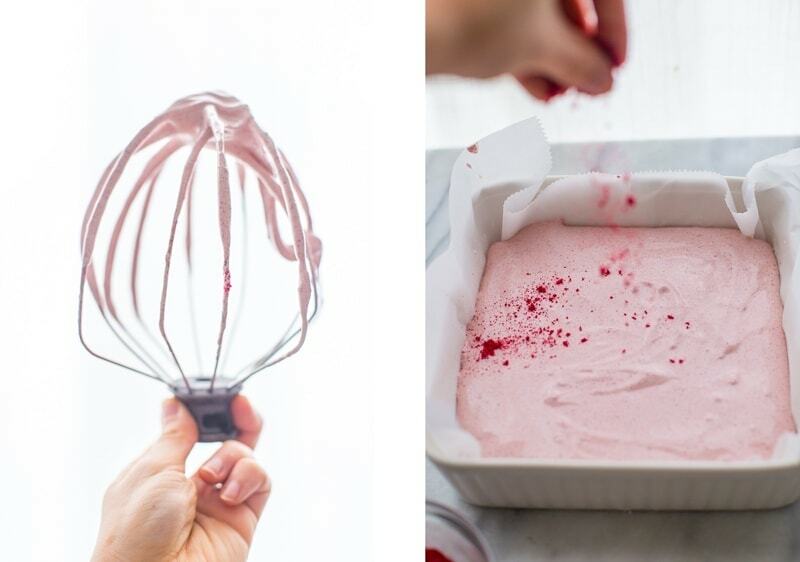 Smooth the top with the spatula and sprinkle a little (1/2 tablespoon) of the raspberry powder you reserved on top. Let dry, uncovered, at least 4 hours or overnight. Do not refrigerate. Combine 2 tablespoons arrowroot with the remaining raspberry powder (about 2 tablespoons). Lift marshmallows out using the sides of the parchment and use a bunny dipped in the arrowroot-raspberry powder mixture to cut out shapes. For regular marshmallows, use a very sharp knife coated in a bit of the arrowroot-raspberry powder mixture to cut into cubes. Place marshmallow shapes in a large bowl and coat with the remaining powder mixture. Toss until pieces are well-coated. To create Peep eyes and mouth, melt the dark chocolate chips in the microwave in 30-second bursts, stirring in between each burst. Use a toothpick to dot the melted chocolate on the "face" of the Peeps. It might be tricky, since the surface is covered in arrowroot, but you can almost spear the surface to help. 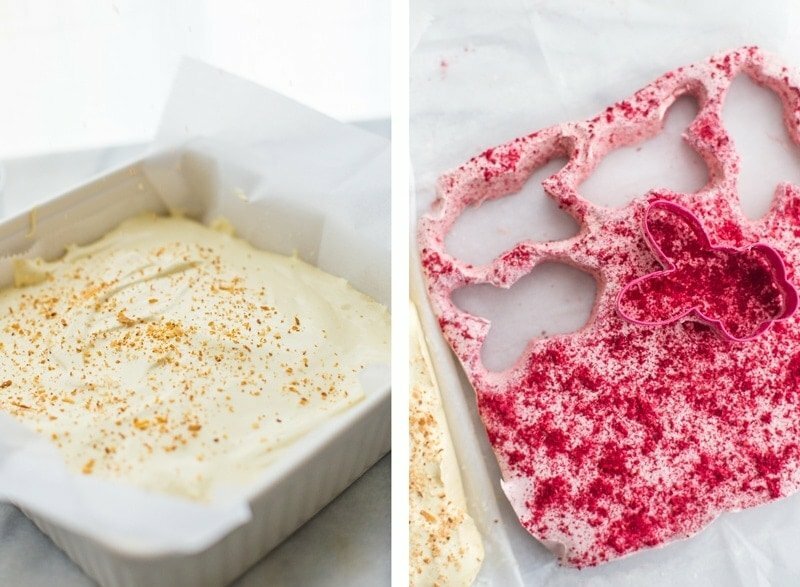 Keep in an airtight container for a few days or in an airtight freezer bag in the freezer for months. Thaw 2 hours before eating. Place toasted coconut in a blender or food processor and blitz until ground fine and texture is consistent. Combine 1 cup honey, 6 tablespoons water, 2 tablespoons lemon juice, and 1/4 teaspoon salt in a medium saucepan with high sides. 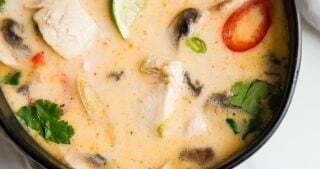 Place over medium heat and bring to a gentle boil, whisking until very smooth and well combined. Continue boiling very gently for 10 minutes, or until a thermometer reaches 240ºF. Remove from heat. Stir in gelatin and water mixture and whisk until very smooth. Let cool for about 2-3 minutes then stir in 2 teaspoons vanilla extract and 1/4 teaspoon turmeric. Add honey syrup to the large bowl of a stand mixer with whisk attachment. Beat on high speed for 5 minutes or until tripled in size, almost white. The texture should be like a soft lava that holds a soft peak for a few seconds. 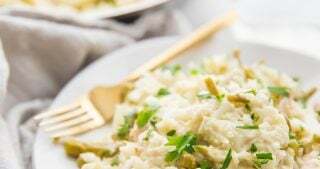 Add in lemon zest and remaining 1 tablespoon lemon juice and beat for another 2 minutes, or until well combined and a lovely, even light yellow color. With a rubber spatula, scrape out marshmallow mixture and spread into one prepared 8x8" pan. Smooth the top with the spatula and sprinkle with 1 tablespoon of the ground toasted coconut. Let dry, uncovered, at least 4 hours or overnight. Do not refrigerate. Lift marshmallows out using the sides of the parchment and use a bunny dipped in arrowroot to cut out shapes. For regular marshmallows, use a very sharp knife coated in a bit of the arrowroot to cut into cubes. Place marshmallow shapes in a large bowl and sprinkle with remaining 3 tablespoons ground toasted coconut. 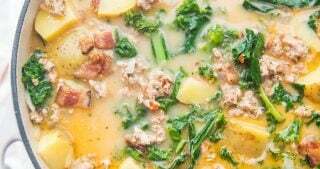 Toss to coat, then sprinkle with 1 tablespoon arrowroot. Toss to coat until no longer sticky.